The threat of secular reformation is hanging over Orthodoxy. We have written about this more than once, but just a few years ago we could not have supposed that through the efforts of the Constantinople Patriarchate this threat would take on a completely new form, the form of Greco-Protestantism,1This term is apparently mirroring the term Greco-Catholic, or Greek Catholic  the name often used for Uniates, or Byzantine Rite Catholics.  O.C. about which we will speak more particularly below. The Russian Orthodox Church is at the moment not being accused of servility and phytelitsm,2At least in Russia.  O.C. since against the background of the Ukrainian government’s interference in church life such accusations simply pale. 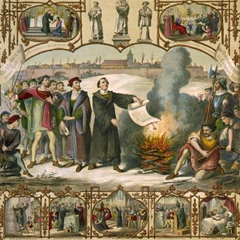 Nevertheless, the general traits of many statements now coming from ideologists of religious reformation are the same as before  proposals to reorganize the entire church structure. Moreover the Church’s many centuries of conciliar experience and rule by canon law is being edited out, without so much as a parenthetical reference. It is quite explainable that the reaction to these new challenges is not only the sobering up and concentration of the healthy majority in the Church, but also a vigorous reanimation among the liberal Orthodox subculture, which always correlates precisely with external political events. The church liberals’ initiatives are in submission to one goal  the direct or indirect support of the Constantinople Patriarchate in its efforts to transform Orthodoxy into a kind of post-modern ideology. Today this is one of the most interesting questions: Against the background of the watershed events of a new schism, how is liberal-Orthodox thought developing inside Russia? Telling in this sense is the compilation-article by Leonid Sevastianov, "Orthodox Blockchain" (published autumn 2018), in which the author sums up the more frequently appearing ideas of liberal Orthodox society. If we were to define the thesis of the article’s content, it would be the following: Orthodoxy should be built according to a general principle that is being obstructed by the ecclesiastical "vertical authority". Sevastianov uses the term, "blockchain", by which he tries to describe a "model of self-organization of society, which is not ruled from above but rather spreads responsibility and decision making among its members." For those unfamiliar with the term, blockchain is what they call a public database with information on the transfer of money from one addressee to another. Every church community that belongs to the so-called Orthodox blockchain is, in the author’s mind, an independent Church, and all together they make up one Church, the center of which is continually moving around along a chain from one block to another. Sevastianov states with pleasure that this proposed model guarantees that schisms would be impossible. And that is true, because this model they are proposing is permanent schism. In fact this is what we have seen over the past four hundred years in Protestantism, where schism is a norm of existence. The author further proposes introducing an elective episcopate as soon as possible, and reformatting the Church as a "confederation of free communities" (this term was coined by Stanislav Belkovsky ten years ago), inasmuch as the "center of spiritual life is not in the bishop, who is the same member of society as any layperson, but in the parishes, monasteries, and evangelical groups." Sevastianov doesn’t even mention the institution of patriarchy as an historical phenomenon, since for him it so obviously has no place in this model. The figure of the Patriarch is erased from Sevastianov’s imaginary picture of the ecclesiastical world. This is logical, because in the Protestant way of thinking the institution of patriarchy does not exist. The alluring epithets, "confederation", "self-sufficient spiritual centers", and "blockchain" do not change the essence of this phenomenon. Looking at the example of modern Protestants it is very clear how a movement in this direction will end. The number of "churches" will multiply, each one with its own rules and isolated from the others. The parishioners’ freedom within such a community is often very limited. Meanwhile we see unlimited, arbitrary reformations of Christian dogma. Some Protestant movements are even demanding that people do away with the "totalitarian concept of sin", or the "personality cult" of Christ. For the Orthodox ecclesiastical space, schism is a sickness that we simply cannot pronounce as the norm. In modern Orthodoxy, schism often arises in the form of a quasi-church, a structural imitation of churchliness according to the model of a "church" within the Church. Such a schism is often initiated from without, as in the case of the false "legitimatization" of the schismatic structures of the "Ukrainian Orthodox Church Kiev Patriarchate" and the "Ukrainian Autocephalous Church". The main initiators and profiteers of such processes are always secularist centers of power. If we were to liquidate the Church hierarchy, which is what Sevastianov and other representatives of the liberal Orthodox establishment are basically proposing, then its place will immediately be occupied by a certain political "vertical power" that will take advantage of the situation for the sake of its own interests, which is what we are seeing today in Ukraine. The ideal church life for the liberal Orthodox is a state of slow-burning schism and chaos. Because the state of chaos-making in Orthodox space makes it easier to force a change in religious identity. The liberal Orthodox in and of themselves are a particular form of inner schism. Essentially having already separated themselves from the Church, they are in no hurry to leave it. Their main aim is not to create their own space or their own community, but to corrupt another space, another community; to deprive others of this space who think differently from them. In other words, to clear out the Orthodox territory and Protestantize it, preserving the outward ritual form of Eastern Christianity. That is, to create a new type of "spiritual unia" with Protestantism  Greco-Protestantism. And as a battering ram they are using an infirm, weak-willed man  Patriarch Bartholomew (Archondinis). The schism in Ukraine will inevitably hasten the formation of the Greco-Protestant ideology, and then there will be a push for the creation of an analogous structure in Russia. This is part of one whole process. Therefore, today the theoreticians of liberal Orthodoxy are not only working out the concept of the liberalization (in other words, Protestantization) of Orthodoxy, but are already thinking about who will make it happen, and on what social strata they will rely. We can view the institution of "active parishioners" (derived from the idea of "active citizens" from the era of the Moscow revolution of 2012) as a platform for the final stage of the Church’s dechristianization and Protestantization. In upcoming years, the Greco-Protestant doctrine will be studied and outlined in detail by theologians and philosophers. We are at the very beginning of this road, but as the author of this term, I will already now allow myself to distinguish the four main parts of it. Rejection of apostolic succession. Patriarch Bartholomew has clearly demonstrated this by receiving into Church communion men having no canonical ordination. Apostolic succession becomes a matter of indifference to adherents of Greco-Protestantism, just as it became a matter of indifference to the Catholic monk Martin Luther in his day. The "blockchain" structure of the church, organized, as the adherents of Greco-Protestantism assert, according to the principle of a "confederation of free community associations." The Church will be forced to have elections of bishops, and then of clergy, who will turn it into a friable, amorphous medium without any spiritual unity, composed of a multitude of "denominations", "wings", "movements", etc. The renunciation of patriarchy for Local Churches with the temporary preservation of patriarchy in Constantinople itself, which will serve as the "motor" for these transformations  until the time comes. Ethnophyletism. That is, structuring the Orthodox Churches along the lines of a national principle, and transferring their allegiance to their ethnocrats. There is an idea being propagated that every country should have its own national Orthodox Church. The formation of Greco-Protestantism and transformation of the religious space will meet with resistance from the Church’s majority  the supporters of traditional Orthodoxy founded upon the following of canons and the principles of apostolic succession, and on the preservation of Church hierarchy. The hierarchy of the clergy is both a tradition and a symbol, and at the same time, the condition for preserving the Church. The Church is an image of heaven on earth. That means that the Church hierarchy reflects the heavenly hierarchy, and Church conciliarity ("communality") has its prototype in the indivisibility and freedom of the Persons of the Holy Trinity. The Church consists of many communities and forms the one Body of Christ, and freedom within the Church cannot exist without the hierarchy of clergy. Freedom and communality are not negated by hierarchy, but to the contrary are strengthened by it. In part, the hierarchy defends the church space from being swallowed up by external political powers, the "secular vertical", and "secular Leviathans". At the moment we can observe how these power centers are applying repressive measures against the Apostolic Church in Ukraine. In order to stand up against similar repressions, the Church needs a hierarchy. Symbolism and tradition here go hand in hand with historical pragmatism. It is on this very path that the Church will escape the apostasy connected with the sickness of Greco-Protestantism, and preserve and multiply is spiritual influence. Alexander Shchipkov is a political philosopher, and first Vice Chairman of the Synodal department of the Russian Orthodox Church for Church interrelations with society and media.